"The Little Group That Roared"
It all began in 1991 with a small group of local year-round residents in a tiny resort village called Pointe au Baril on majestic Georgian Bay in Northern Ontario, Canada. Following the tremendous success of the Pointe au Baril Centennial in 1989, local individuals interested in promoting art, theatre, photography, music, comedy, and culture formed the Pointe au Baril Arts and Culture Club. Actual productions began in 1991 and the now famous "Arts on the Bay", the brainchild of the Arts and Culture Club, was born. Since the Dinner Theater's inception our presentations have included Mystery Theatres, Musical Comedies, Gilbert and Sullivan Productions, Music Hall Pub Nights, Broadway Hits, the repertoire of Andrew Lloyd Webber, and much more. As enthusiasm grew, it was thrilling to have some of our seasonal residents join in our endeavours to produce first-rate musical and theatrical productions, resulting in 1997 being a total 50-50 collaboration. 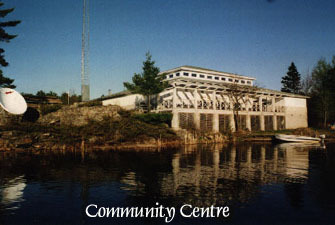 All performances held at the new Pointe au Baril Community Centre, overlooking beautiful Georgian Bay.